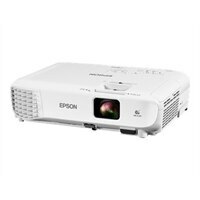 Epson PowerLite Home Cinema 760HD Home Theatre Projector - Portable HD ProjectorBring widescreen, hi-def entertainment to your living room or backyard with the Home Cinema 760HD portable projector. Get life-sized images up to 300-inch - up to 25x larger than a 60-inch flat panel - in 720p. Easily connect Blu-ray, gaming or streaming devices via HDMI. Featuring 3,300 lumens of color/white brightness, the 760HD shines bright. Plus, Epson 3LCD projectors deliver remarkable color accuracy, with up to 3x Higher Color Brightness and up to 3x Wider Color Gamut over competitive DLP projectors - and no rainbow effect. All this, and dynamic contrast up to 15,000:1, a built-in speaker, and setup tools - perfect for HD fun right out of the box. Bring widescreen, hi-def entertainment to your living room or backyard with the Home Cinema 760HD portable projector. Get life-sized images up to 300-inch - up to 25x larger than a 60-inch flat panel - in 720p. Easily connect Blu-ray, gaming or streaming devices via HDMI. Featuring 3,300 lumens of color/white brightness, the 760HD shines bright. Plus, Epson 3LCD projectors deliver remarkable color accuracy, with up to 3x Higher Color Brightness and up to 3x Wider Color Gamut over competitive DLP projectors - and no rainbow effect. All this, and dynamic contrast up to 15,000:1, a built-in speaker, and setup tools - perfect for HD fun right out of the box.